Generally I labor under the delusion that most people are smart and compassionate. And on the whole, this does seem to be the case. People hold doors for me, say please and thank you, and smile back. Unfortunately the advent of the Internet and the ability to remain cloaked and anonymous has led to some people being able to let some of their worst impulses fly free. 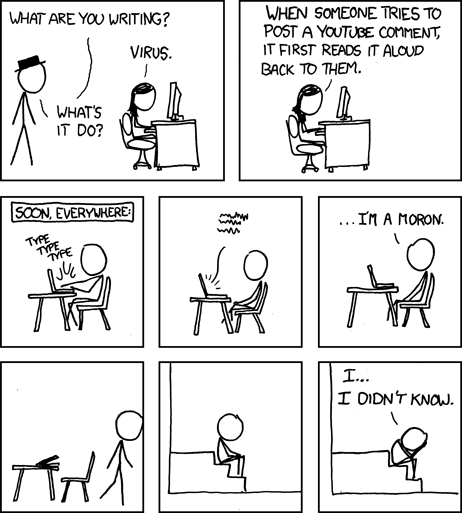 No where is that more apparent than a comments section on a blog or news site. Comments sections have been popping up recently; now almost all major news affiliates have them, not just the blogs. Usually there are some good, intelligent comments, but all too often you get to see people behaving their very worst. For example, YouTube’s comments section is pretty much in a league of its own for comments that are severely racist and misogynistic, willfully ignorant, and comments that are there simply because the poster is looking to rile people up by being as foul and insulting as possible. I’m not going to give you a specific example, but you know what I’m talking about. In situations like these, opinions get heated, challenges are thrown, and then it’s insulting mothers and telling people to die in a fire. It’s led to me avoiding the comments sections on larger media sites simply because I’d like my faith in humanity to remain intact, thankyouverymuch. But if you’re commenting on a blog and you get sucked into the crossfire, what do you do? Let me back up here. This all stems from an innocent comment I’d left on a media blog. Generally I feel okay posting there since it’s lesser known and generally moron-free. Unfortunately, the blog post in question was linked to by a few more well-known sites and thus the Internet at large leaked into the comments section. My comment was rather rudely replied to by someone equating my I.Q. with my bra size. Because physics does not allow me to reach through the Internet and smack that commenter upside the head, I was left with two options: I could be the adult and ignore the comment, or I could start handing down snark like I was a commenter at ohnotheydidnt. I chose the former. Because quite honestly, I don’t care how good it feels, but you don’t bait the troll. That way lies only madness. The other side of this argument is to not rise to the bait. There’s a lot to be said for walking away from an argument, especially if all you’re doing it beating your head against a brick wall. It’s not going to move, you’re going to have a headache, and you’re going to look like a fool for doing it in the first place. Now what if you know the person who is causing your blood pressure to rise? I mean, there’s not much we can do on larger media sites, other than grit our teeth and close the browser. Here in the SEM industry, it’s much smaller and therefore if someone’s behaving badly, it’s hard to do so without a cloak of anonymity. Especially if it’s someone you actually know. The Bruce Clay, Inc. blog had something along these lines with Lisa Barone’s post SMX Advanced Goes To The Dark Side. What started out as a discussion of black hat SEO techniques in the comments section turned quickly into a heated argument. There you can see people having forceful conversations with each other (and disagreeing) without it devolving into name-calling. And then you can see some threads where the reverse is true. What’s the secret to having a heated discussion without it going too far? • Keep it impersonal and to the topic at hand. • Saying you don’t agree with the commenter’s opinion is different than calling them an idiot. • Disagree! List the reasons why you disagree! But please, do NOT drag their mother/dog/personal hygiene into the conversation. That is irrelevant and will just cause headaches for everyone. Again, I don’t care how good it feels, don’t do it. These are just some general examples of commenters gone wild. How about those of you out there? Have any horror stories of your own to share? Oh, and lest you get the idea that our comments section is a great place to test out the what not to do in commenter etiquette, let me be the first to tell you that we have no problems siccing Susan on you if you don’t behave. You have been warned. Don’t talk about their mother? Just state your stance and walk away? [puzzled face] Why are you trying to ruin my Internet? That said, you’re right. Feeding the bad people does nothing to make the blogosphere a better, more intelligent place. And though Susan has had to talk me off the ledge a number of times, I think I’m getting better at keeping my cool. Or if I’m not, please don’t tell me. I at least like the illusion.